I've not been blogging for a month or so due to the arrival of baby Grace! But I'm back at work on Monday so I'm gradually easing back in to the world of librarianship, starting with some stuff I meant to blog links to ages ago but never got around to... 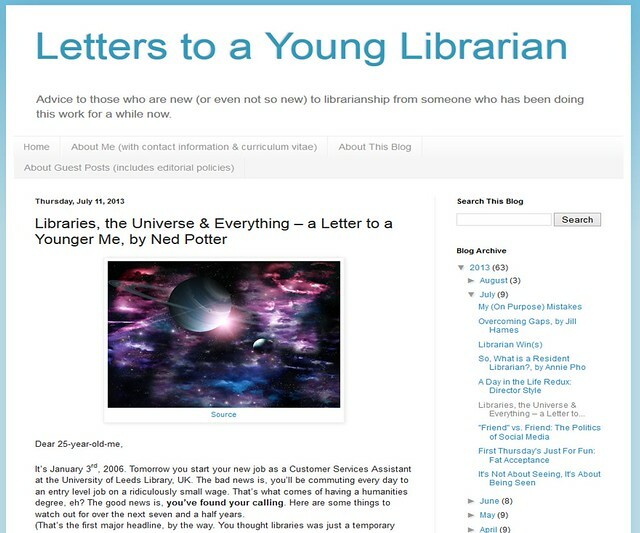 I was delighted to be asked to write a post on the Letters to a Young Librarian blog run by Jessica Olin. It's a really good blog and one that I read a lot anyway, so it was really nice to do something for it. Here's my post. Communicating our value PROPERLY at every opportunity. Trying to inspire people rather than placate. Understanding that work-life balance is important enough that it should not be considered with reference to what ANYONE ELSE IS DOING. Libraries have always been product orientated, but now they need to be market orientated. .
Each of these is expanded in the post; it was fun to think about this stuff. Thanks to Jessica for asking me and the reader of her blog who requested the post! Six Questions with me about marketing stuff, on the 658.8 blog . Normal blog service will now be resumed!